Remember how curious I was about the Ellis Island Research Room, but really didn’t know anything about it? Well, I finally emailed the folks at Ellis Island, and now I’m glad that I did not take the time to check out the Research Room. It turns out that it is just access to the Passenger Search Database, which we can access from home. And the “consultations” are just people there who can assist you with your search. I’m sure there are some folks out there that might like this. However, I’m glad that I saved $7 and a block of time that was better spent in the museum itself. I recently had a neat break-through totally by accident and came across a new-to-me second cousin! The best part was that she lives only an hour away from me in New York City. Since she is relatively new to family research, she wanted to visit with her local Family History Center, so did I want to come? I never went to an FHC before, so I figured why not? I’d get to check one out and meet my cousin at the same time. The FHC we were to meet at was on the west side of the city, and Google Maps showed a nice big building there: Church of the Latter-Day Saints. Yes, most of the building was for the Mormon’s church, but the FHC was there as well. I’d done a little homework and found the number for a roll of microfilm that might give us clues about our Polish great-grandfather’s naturalization; that should be a good start, right? I had visions of genealogy books and rows of microfilm readers and computers! Outside the FHC (which was conveniently across the street from the subway stop), I met my cousin with a hug, as well as a good friend of hers who was researching his family as well. We were ready for our field trip! We went inside, followed some signs for the FHC within the building…and came to a room no bigger than my living room with a bunch of computers (all occupied) inside. I briefly felt uncertain and could sense my cousin and her friend felt the same way. Right away, a worker from the FHC saw us and welcomed us. She asked if we wanted to see the “other room” with the microfilm readers and a couple more computers. “Sure!” we said, eager to see if there was anything else. We were brought to the room, which had a couple of readers, a microfilm scanner (cool! ), and a few more computers. (I could also see it doubled as a Sunday School room for little ones! They must have had a lot of self-control not to touch the interesting machines…) We were happy that, for the most part, we could have this room to ourselves. My cousin and I had a LOT of talking to do, as well as research. We’d found a bunch of things online while we were there, and I showed her how to use the FamilySearch wiki as I explained how to find out what vital records might be searchable online vs. needing to be purchased. Meanwhile, our host tried looking for the microfilm I wanted to see. Sadly (so, so sadly), she could not locate it, even though their system said it was there. The host even let me look in the microfilm room, to no avail. Nope, not in here! 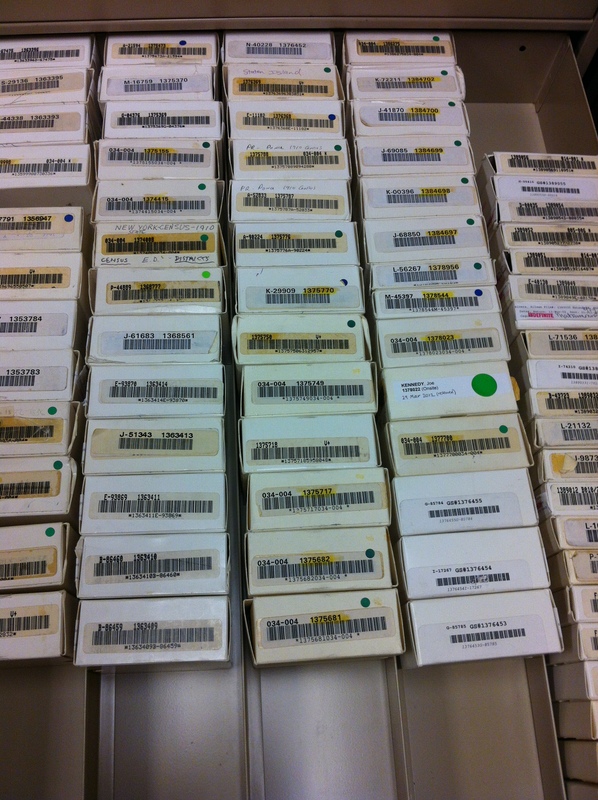 Microfilm at the Family History Center in NYC. Author’s collection. In spite of not making any huge finds, it was still a good visit. We had enough space to ourselves to be able to tell family stories, ask each other questions, and do some on-line exploring together. There was even wifi, which enabled me to pull up my cloud-stored records on my iPad to show my cousin. My cousin’s friend even found some records he was not expecting. The host was very, very accommodating (she even let us use her own laptop while the computer we’d been using was needed for the microfilm scanner). She promised to email me if they found the missing microfilm. As we were leaving, our host asked if we could please sign their guest book. The more people they showed as visiting the FHC, the more money and resources (including space) they could have. You bet we’d sign! So although I was kind of let down by the size of the “center”, it was still a good visit. After all, I was with family and we were doing genealogy! Back to Al Pleau for a Minute! It figures that as soon as I complete my posts on Al that I would discover something completely new about him! So I looked on the microfilmed California Death Index on FamilySearch. Sure enough, there was Al Pleau, died in San Francisco on August 9, 1928 at the age of 50 (which would be his exact age). And even though I’ve been checking Find a Grave forever, I checked it again and found two entries (seems that one is a duplicate which appears to be deleted now) at Holy Cross Catholic Cemetery in Colma, CA (which is on the San Francisco peninsula). One of the entries notes how he was a veteran of vaudeville. New York + 50 years old + Catholic + vaudeville = gotta be my Al! Of course, I requested a photo of his gravestone on Find a Grave. A contributor who works this cemetery contacted me and told me that sadly, the section that Al is buried in is for the indigent and there is no individual stone for him. There is only a statue that marks that section of the cemetery. Now that I know that Al died in 1928, this makes me think of the impact on his family. He died before my great-grandfather George did, so surely George would have heard of Al’s death while he was living in Baltimore. I wonder how it impacted George, even though he hadn’t seen Al in nearly a decade. I wonder if he spoke of it to my grandfather, who wasn’t even six years old yet. If he did, I’m certain that my grandfather did not remember much about it, based on what little he was able to convey to me about his father’s family. I also wonder how Al died at such a young age. In any case, finding Al’s burial site has enabled me to find the last of where this family is buried. I’ve been able to reunite him with his family on Find a Grave and in my virtual cemetery there. I’ve felt a sense of resolution or completion in all of this. However, I am not done posting about this family!